The Dynamix industrial stainless steel tote tank mixers enable portable quality control for your product. Originally designed for the Automotive Industry the ITM Industrial Stainless Steel Tote Tank Mixer is increasingly applied in new industries to increase quality control and economies of scale. Often when batches are too small for processing in a large steel tank, the ITM for steel totes can be used to make small batch processing possible. The ITM steel tank mixer is configured with several Dynamix innovations, but most important is our knowledge of mixing challenges unique to steel tank or steel totes. Steel Totes of all Volumes and Geometry can be mixed by our ITM Line of Industrial Steel Tank Mixers. 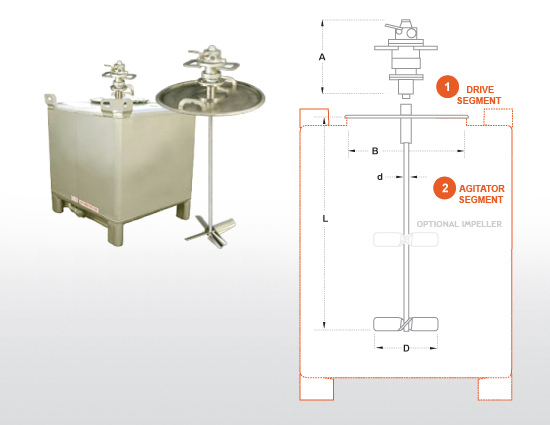 These unique mixers are a response to a need for increased quality control in chemical mixing and re-suspending, as well as flexibility in chemical product supply. We believe that quality chemical mixing does not stop with large industrial tank mixers and process mixers. By Engineering the ITM to suit your chemical process the ITM can become an integral part of your product quality control. Note: we do not have one single model for industrial steel tank mixing, we have tote mixers for each type of tote container and configurations to address all the challenges of tote mixing. If you are unsure of your tote or tank design just contact us directly or submit our request for quote with the information that you have. The following videos describe how the ITM enables your tote to become a quality mixing vessel through proper mixing, featuring two unique quality assurance characteristics. Then we will show how this quality control can be applied throughout your product’s life cycle. Conventionally, the diameter of a mixer’s impeller is limited by the small opening in a tote. Not with Dynamix’s collapsible impeller. True portability that can be installed by one person and enables you to address uniformity issues on site, or your client’s site. Dynamix’s dynamic drive coupling protects your product from exposure and cross contamination.